The Clapp Favorite Pear statue is located in Edward Everett Square. For years, I’ve whizzed down Columbia Road in Dorchester and pondered the same question as I round the corner at Edward Everett Square: What’s with the gigantic pear statue? It turns out the 12-foot bronze sculpture in the square celebrates not just any pear, but the Clapp Favorite Pear. 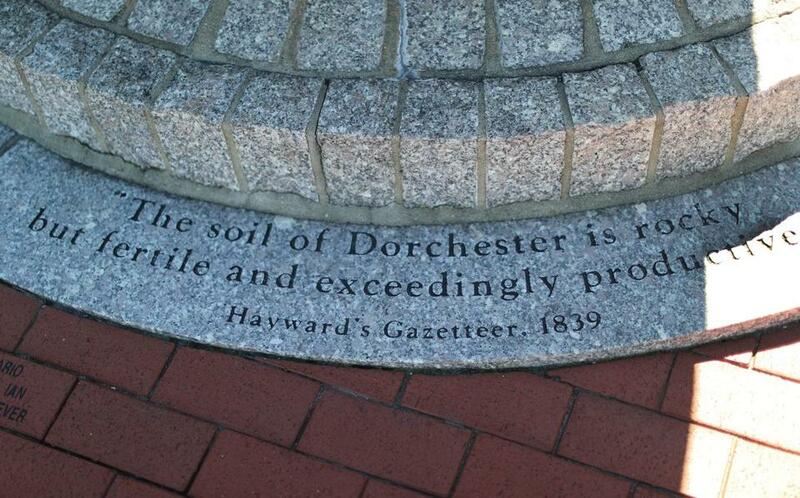 This is the area where Dorchester was first settled; it was part of a 300-acre estate and fertile orchard. The Clapps were a family of farmers experimenting with new types of fruit trees, especially pears. The variety they called the Favorite Pear, known for its tough skin and sweetness, was first grown here in the 1880s. Eventually, this peaceful farmland became a tight-knit residential community, and finally gave way to a bustling six-way intersection used by thousands of motorists as they head to the Expressway. In an effort to revitalize this intersection and reclaim its history and neighborliness, the Square was redesigned and unveiled in 2007, with the bronze pear as the centerpiece. It was created by Somerville artist Laura Baring-Gould, who worked on it for five years. For information on Edward Everett Square and the sculpture, go to edwardeverettsquare.org To see previous Peripheral Vision columns, go to bostonglobe.com/section/peripheral-vision. Contact Linda Matchan at linda.matchan@globe.com.